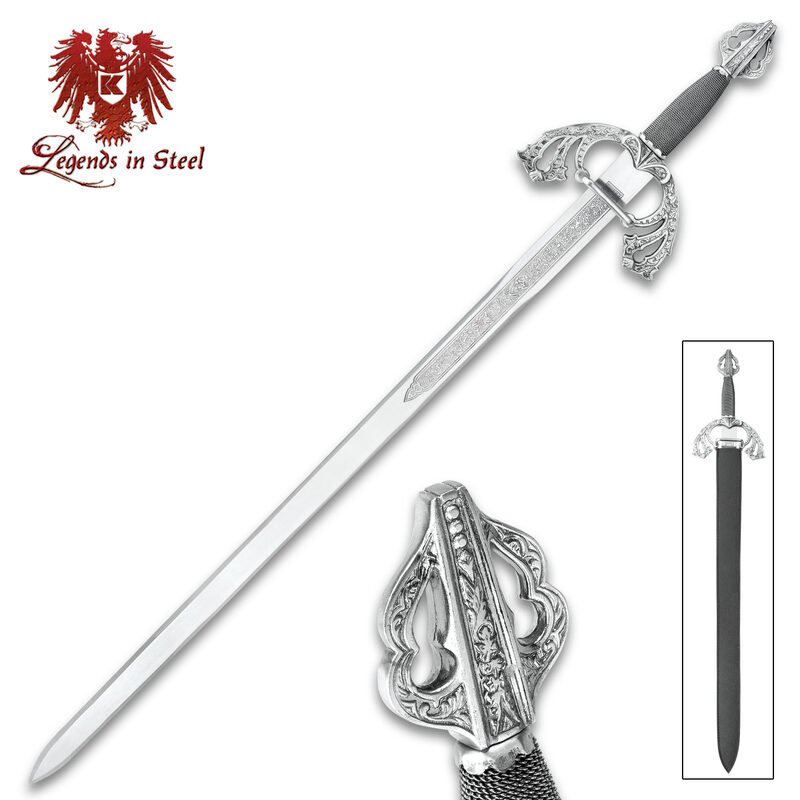 This classic full size sword features a stainless steel 32 in. blade with a classic cast metal handle. Also includes a genuine leather sheath. 40 in. overall. For some reason I was expecting it to be larger then it is. The sheath is not as pictured, and does not cover the entire sword, nor does it fit properly, being very loose. Other than that, it is OK as a wall hanger, with a dull false edged blade. Some nice scroll work on the hand guard, and is offered at a reduced price. I just got this sword today. I wasn't expecting it to be here(like I never do) and when I opened it, I was VERY pleased. I think this is the best purchase I have ever made on Budk. Scratch that out, IN MY LIFE! If you are a fan of medieval swords and weaponry, you will LOVE this sword, just like I do. this weapon is amazing it is a little heavy but i feel like it could do some serious damage. it has quickly become one of my favorites. and it did come dull but i will quickly fix it. would i recommend it to a friend yes but i dont want to cause i love the novelty of being the only one who has it where i live. This sword has a very thick blade and a pretty sharp point, it is false edged but feels good in the hand. TOMAHAWK cutlery is great. This sword is 98% perfect. Its only problem is the handle .It gives you a great grip but puts a mean impression in my hand. I think two of these would look great crossed on my wall. If your looking for a razor-sharp sword,this is not for you. The thing is totally dull which is fine for me. The blade does not wiggle in the slightest. I am proud to own such a great piece. In my opinion,BUDK could charge ten dollars more for this supreme masterpiece. This sword was really sturdy. It was not very sharp. It is my 2nd favorite sword, and had beautiful craftsmanship. The design was slightly faded on one side, I think its a steal. I highly recommend this sword!